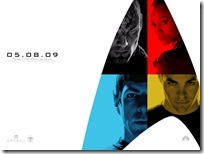 The new Star Trek Motion Picture have launched their Facebook and MySpace pages. They are much more popular on Facebook than MySpace, and it will be interesting to see if these attempts to community build will help out the film or the franchise. I like the face book page because of the nice collection of fan photos. I only wonder how long they will be there. If history is any guide, Paramount will crack down and force these images to go away. If they have learned anything, they will allow these photos to give them free promotion. Only time will tell.